This tutorial is here to help people get started with the Logitech G27 racing wheel. Since this was originally written, Logitech has released newer wheels, the Logitech G29 and the Logitech G920 wheels which are very similar to the G27. If you need help setting up a Logitech G27 or G29 racing wheel, have a look at this page. Calibration and settings for all three of these wheels is similar, but the new ones come with new software that is reported to work better with later versions of the Windows Operating System. If you like a lot of force feedback, or if force feedback is very important to you, you might want to try either the Thrustmaster TX, Thrustmaster T500RS or better still, a Fanatec wheel and pedals setup. There are various opinions about setting up a Logitech G27, G29, or G920 wheel for iRacing. Most of them will work in one way or another. I have experimented quite a bit with my wheel settings and I believe I have found the settings that suit me the best on both asphalt and dirt ovals. At first I tried to follow any official iRacing instruction or documentation that I could find. In general that works pretty well and some people swear by those settings. After I had been an iRacing member for a couple of years I started experimenting with my wheel settings and found that the iRacing recommendations weren’t really the best for me in some cases. The main thing about setting up any wheel you choose to use is to find the settings with which you feel comfortable and stick with them. I’m going to give you my own version of iRacing’s recommended wheel settings for Logitech wheels so let’s get to it, step by step. Click Start, then click Control Panel. If you’re using Windows 10, click Start, then type Control Panel. There is no box to type into. Just click Start and start typing. It should give you a clickable link to the Control Panel. Inside the Control Panel, type “game controllers” in the search box, without the quotes. In the small window that pops up, select the Logitech G27 Racing Wheel USB, then click Properties. In the next screen, click the Settings button. You should now see one of these Windows, depending on how you got to the Settings. It’s the same information organized differently. If you’re using the new software provided with the G29 and G920 wheels, it will look quite different. Go here for those racing wheels. 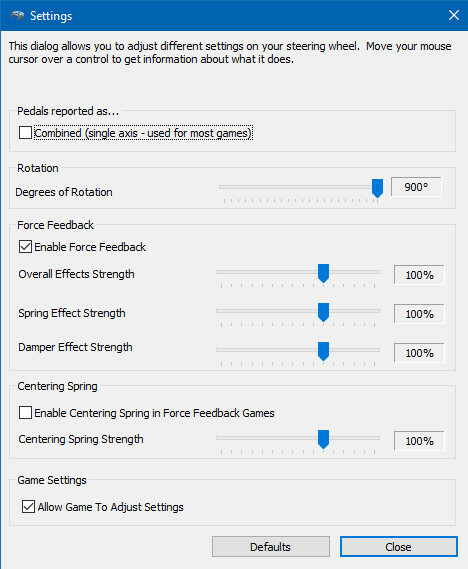 You should set your Overall Effects Strength to 100% instead of 105% or 106%, then use the Min Force setting in the iRacing simulator. There is more about Min Force below. Do not check combined under “Pedals reported as…” I know it says it’s used for most games, but it won’t work for iRacing. Degrees of Rotation should be set to 900° per iRacing. Make sure “Allow Game To Adjust Settings” is checked ✔. If you simply click the Defaults button then move the Degrees of Rotation slider all the way to the right to 900° you should be all set. Click Close, then click OK in the next window. If you have read about wheel settings either here or in the iRacing forums before, you might be scratching your head now. This is what iRacing recommends. Go with it and try it for a while or read on if you want to try my settings. I don’t recommend the iRacing settings for dirt oval racing. The next thing to do is to open the iRacing simulation and calibrate your wheel. 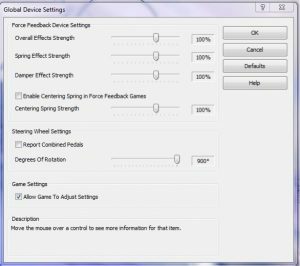 Some or all of these settings may also work for the Logitech Driving Force GT (DFGT). Set Damping to 0%. It is not needed. Uncheck Use linear mode unless you have a very fancy, high end wheel. Set the Strength between 8 and 20. I use 8. I don’t like a whole lot of force feedback. Set Min Force to 10 for now. 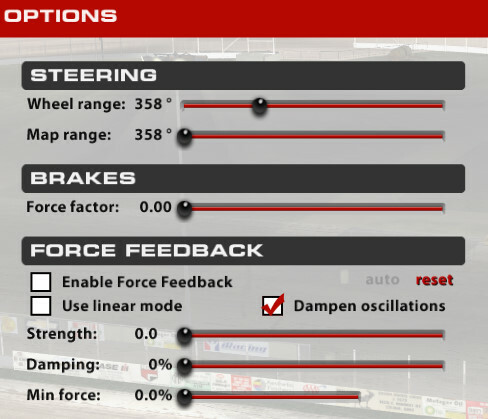 You can adjust min force as you begin using the wheel in the simulation. If the wheel oscillates, chatters or vibrates while you are driving straight, you need to turn down the min force. If you aren’t feeling small force feedback inputs, you should turn up the min force. Somewhere between 8 and 12 is usually good on the G27. Min force is not needed on the Logitech G29 and G920 racing wheels. 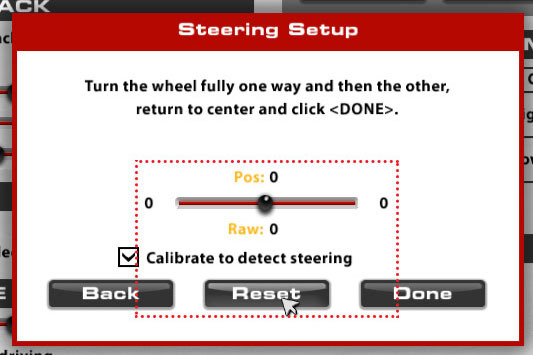 Click Steering under Input Calibration, as shown below. Set your steering wheel at dead center by sight. Click reset. This zeroes the wheel at dead center as shown in the image below. Follow the instructions on the screen. When you “return to center,” make sure “Pos:” should be close to or right at 50%. It’s not a big deal if it’s just slightly off. Click Done to get to the next step. When you turn your wheel 90° to the left as instructed, be sure to turn the wheel 90° to the left by sight, regardless of the numbers that iRacing shows on the screen. I use the hex screw heads around the center of the G27 wheel to set mine. Most wheels fall somewhere around 870° instead of exactly 900°. Click Done, then click Done again to complete the calibration and exit the wizard. Calibrate the pedals and gearbox if necessary. That is the way to set your Logitech wheel up as iRacing recommends. In my opinion, for most asphalt racing this is a good way to go; however, for short ovals and dirt I recommend different settings which I detail below. Below here is the method and the wheel settings I last used before I switched to the Logitech G29 racing wheel. These are the same setting I use for the G29. Keep in mind that I run dirt ovals almost exclusively, but these setting work fine for me on short asphalt ovals also. If you have any comments, questions, or discussions, join Discord. First of all I’ll go quickly cover the settings I used in the Logitech software in Windows. For better detail on this, look at my Logitech G29 and G920 page. Get to the Logitech settings as detailed above. Make sure Spring Effect Strength is at 0. You can uncheck “Enable Force Feedback” if you know you don’t want to use any FFB. I don’t use any force feedback at all. You can also enable it and set it to a lower number like 25% or 50%. Do what is most comfortable for you. Calibrate your wheel in the iRacing simulation the same as detailed above. These are my G27 wheel settings within iRacing. Remember, my rotation in the Logitech software is only 270°. Note that I have it set close to 360° in the iRacing simulation. That makes the steering faster as you rotate the wheel more, so it’s relatively slow near center, then speeds up as you rotate the wheel. It helps you catch the car more quickly in a slide and that’s very important on dirt. Always run the Wheel range and Map range in iRacing higher than the Rotation in Logitech. At least one driver who has won an iRacing NASCAR Driver’s World Championship runs his rotation at about 200° in the Logitech software and a full 900° wheel and map range in the iRacing simulation. Don’t set the brake force factor to 0.00 unless you have a brake load cell modification installed. I think i ran my Brake Force Factor at 1.8 before I installed my load cell kit. Set Damper to OFF. You don’t need it. It was only left there because it was there in NASCAR 2003. That’s per iRacing. UNCHECK linear mode. You only need linear mode if you have a very fancy wheel, per iRacing. You can load the iRacing simulator, run a few laps, then press F9. It will tell you what your Force factor should be in theory. In practice, too much for me. Almost everybody who has experience on the service will tell you to run little or no Force Feedback on the Logitech G Series wheels, especially on dirt. Sometimes the Logitech G Series Wheels will not react to iRacing’s FFB commands unless the force goes above some minimum amount. Min force is used to correct that if you actually want it corrected. I think it can be a nice feature. iRacing suggests a Min force setting between 8% and 20%. You can get a precise number using iRacing’s Wheel Check software, but it’s not worth the trouble. If you get within 5% of the actual number it’s fine. The best way is to tinker around between 8% and 20% until it feels about right to you. If you get it too high, the wheel will tend to chatter when going straight. If you don’t run any force feedback you don’t need min force, just set it to 0.0. If you do run some FFB and you want to dig around under the hood, so to speak, you can change a couple of settings in the iRacing app.ini file at Document\iRacing\app.ini. This applies some smoothing to the FFB output, and is the only good way to stop a car that chatters too much from banging your hands to pieces. If you run very little FFB it’s not likely that you will encounter the chattering problem. Damping will make the problem worse, so use the app.ini setting instead. This is an experimental friction damper that was added a few seasons ago. It works really well on the G Series wheels. It gives the wheel some weight. Try a value of 0.2 and go up and down from there as needed. I don’t care for the added weight feel. That’s all I have for this Logitech G27, Logitech G29, and Logitech G920 iRacing setup tutorial. If you have any comments or questions, feel free to leave a reply below or Join OSR Voice/Text Chat. For the longest time I have been unable to set my wheel to 900 degrees so that you for posting this. But I ran into the issue with my computer on windows 10 it will not let me put the changes into effect it just sets them back to the default. Do you have any suggestions? Thank you in advance. I can’t think of any reason why it might be doing this. You might first try looking at the Logitech website and make sure you’re running their latest G27 controller software/driver. I’m also running Windows 10 and I’m not having any problems saving changes to my settings. The driver for the G27 is actually pretty old, so it’s probably not the driver. Do I need to re-calibrate all the time it is there a way to start without calibrating every use? You should not have to calibrate every time you run the sim. If that’s the case, there is a problem somewhere. Essentially, all the same settings mate, other than the rotary encoder and a few “cosmetic” features they are the same wheel. Ahhh no you don’t, can you post a screenshot of the new software because i dont see any of these settings. How come my force feed back will shut off/on when I’m driving…? It could be a motor going bad I suppose. You might try turning the FFB down in the game and see if that helps. The G series wheels do seem to work better with a lower FFB setting. When I run on asphalt I have the in-game setting at 0 or 1. On dirt, always 1. Something else occurred to me. Sometimes the wires for the power supply can get frayed where they come out of the base, especially if you move your wheel around very much. If you’re losing power intermittently that would also do it. Inspect the wires or try having someone move them around while you’re driving and see if you can tell if that’s the problem. same, help? when i go to control panel –> set up controller –> properties –> settings, there is only a calibration tab. Actually, the instructions above, “Logitech G27 Racing Wheel Settings in Windows” work perfectly. Result is the same Global Settings Window. Im having issues setting up my g29 when it ask me to turn my wheel 90 degrees what exactly is 90 degrees on these wheels. Imagine a circle. It has 360 degrees. Draw a line from the top of the circle to the bottom. Follow the arc of the circle from to top of the line to the bottom. That’s 180 degrees. Half of 360. So half of the total 360 degrees is 180 degrees which is half of the circle. You are looking for 90 degrees. So 360 divided by 90 is 4, or 4 parts of the circle evenly divided. So 90 degrees is 1/4 of a turn of your wheel. Grab the wheel at the top center and turn it to the left (counter clockwise) until your hand is halfway between the top and the bottom. You will have turn your wheel 90 degrees or 1/4 turn to the left. Are your g27 settings the same for dirt in iracing? Yes, after trying a few different settings, the iRacing recommended settings work best for me.